He retired the first 17 tonight. Plus he retired the last batter he faced in the game before the perfect game. That makes 45 straight batters retired. That breaks the record of 41 held by Jim Barr and Bobby Jenks. But it was reported in several places just about as soon as it happened. I was not first. The first player to hit 2 grand slams in one game was Tony Lazzeri, in 1936. Maybe it is not surprising no one did it before 1920, in the dead ball era, when HRs were rare. So I use 1920 as the starting point for the comparison between these two rare events. I only include regular season games, so Don Larsen's perfect game in the World Series will not count. And I also include all games where a pitcher had 9 perfect innings from the start of the game, regardless of what happened after the 9th inning. So I include Harvey Haddix's 1959 game and Pedro Martinez's 1995 game. After all, it was not their fault their teammates could not score just one run for them. They did match what these other pitchers did. Using the data from the Baseball Almanac site, that leaves 15 perfect games since 1920. That is two more than games when a player hit 2 grandslams. There were about 149,000 major league games played from 1920-2008. So prior to this year, a perfect game happened once every 10,642 games. Two grandslams in one game happened once every 12,416 games. Looking at the Baseball Almanac sites, you can see that in 1968, 1995, 1998 and 1999 both events occurred. So 2009 is the 5th year that both happened. But this time it was only 4 days apart. In those other years the two events were always atleast a month apart. How Important is Home Field Advantage in the World Series? That is the name of an article I wrote a few years ago for Beyond the Boxscore. It is at How Important is Home Field Advantage in the World Series?. I figured out the probability of the team with HFA winning in 4, 5, 6 and 7 games and then added those together to get 51.52%. Not everyone agreed with my methods and you can read about that in the comments. I got reminded of this because Sky Andrecheck recently wrote an interesting article at Baseball Analysts called Is The All-Star Game The Biggest Remaining Game for Dodgers?. He came up with 51.26%. We both used the historical average of home teams winning 54% of the time in regular season games. "Here's how things work: a pitcher can influence the rate of fly balls he gives up. By this logic, the more fly balls allowed, the more total balls will clear the fences for home runs (all else being equal). However, while a starting pitcher can control the rate of fly balls allowed, he cannot do a very good job of controlling the rate at which those fly balls become home runs (with very few exceptions). To put it more simply, starting pitchers don't have any underlying ability to prevent home runs—the best they can do is prevent fly balls. If those fly balls are clearing the fence at too high a rate (or too low), we say that the pitcher has been unlucky (or lucky)." I am not sure I completely agree with this. It could be that there is a difference in flyballs allowed that accounts for the HR rates allowed across pitchers. 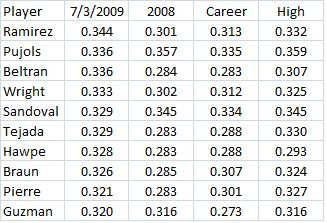 But whatever the reason, the year-to-year correlation of HR rates allowed by pitchers, although not as high as they are for their walk rates and strikeout rates, they are not small. The data I looked at involves year-to-year correlations of various years for pitchers who faced at least 500 batters in both of two consecutive seasons. The table below summarizes the results. Starting with the 1955 season, I eliminated IBBs from the calculations. HBP were counted as walks in all years. 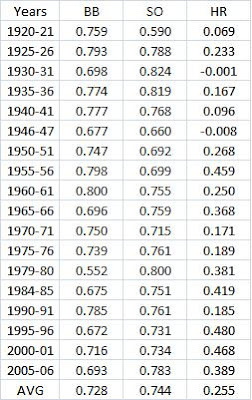 The columns show the correlation between the rates allowed for each stat year-to-year. The last line is the simple average of all the correlations. Overall, the correlations are much higher for strikeout rates and walk rates (the denominator I used in all cases was batters faced). But the correlations do seem to be getting higher for the HR rates. It was very surprising to see how low they were in some of the earlier years. One more thing that I tried (and this really makes me think that we should keep looking at HR rates) is that I found a high correlation in HR rates from one period to the next using more years. For that, I found all the pitchers that had 1000+ batters faced in both the 2003-05 period and the 2006-08 period. The correlations for walk rates and strikeout rates from period 1 to period 2 were 0.736and 0.767, respectively. But for HR rates it was 0.505. This seems high enough to say that, yes, pitchers do differ in the HR rates they allow, even if the reason is their flyball rates. He leads the NL in both HRs and RBIs by 7. He is 2nd in AVG with .336 while Hanley Ramirez is hitting .344. But I compared Pujols to Ramirez and the rest of the NL top ten in AVG, and based on previous performances, Pujols has done much better in AVG. The table below shows the current averages of the NL top 10. It also shows what they hit in 2008, their current career average, and their highest average before 2008. In terms of what he hit last year, his career average and his high average, Pujols is well ahead of the other guys in the top ten. Sandoval only had 145 ABs in 2008 and only has 422 so far in his career. Pujols also has a history of hitting well after the All-Star break. Last year it was .366 and for his career it is .344. Looks like he has a good chance to lead in AVG once the season is over.